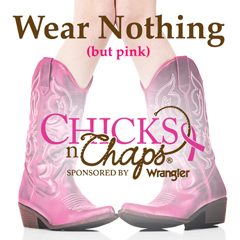 Wear nothing (but pink) for Behind the Chutes! Don’t miss your chance to meet some of our professional entertainers, behind the scenes tour, and friendly belt buckle competition meant for just the ladies! Complete the form below to reserve your spot. Registration is free and attendees must be at least 21 years. How did you hear about Chicks 'n' Chaps? I understand that I am a participant in the Chicks N Chaps™ event. I hereby release Springville Sierra Rodeo, its officers, staff, volunteers and sponsors, and organizers of Chicks N Chaps™ from liability for injury, loss or damage associated with participation in this event. I certify I am over the age of 21. I understand the risk of this event, accept all responsibility and agree to participate. Photograph Release: I give Chicks n Chaps™ permission to use photo(s) of myself in this event for promotional purpose, should the occasion arise. Registration is free and donations are much appreciated.